Natalie Haythornthwaite has left Wasps Netball to join Australian side New South Wales Swifts for next season. The move will end her two-year stay at Wasps, which has seen the Wing Attack/Goal Attack be a star player in the back-to-back Vitality Netball Superleague title winning squads. Roses’ Commonwealth Games Gold Medal winning team. After starring during her short stint at NSW Swifts, the Sydney-based franchise have moved to acquire her talents for next season. Haythornthwaite, who is a fans’ favourite with black-and-gold supporters, said she is proud to have been part of the first two years at Wasps Netball and will continue to follow the club from Down Under. “Wasps have been an incredible club to be part of for the last two years,” she said. “I feel extremely lucky to have played for such an amazing club and made so many great friendships during my time at Wasps. 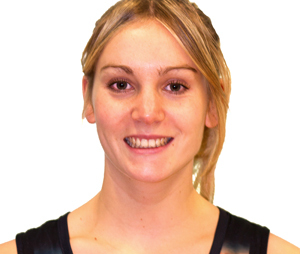 “Wasps have been a huge part of my life over the last two years and I’ve really enjoyed my netball whilst being there. “I’m really excited for my next chapter of netball overseas with the New South Wales Swifts. It’s an exciting challenge which I know everyone at Wasps will be supporting me with. Wasps Head Coach Mel Mansfield is disappointed to lose a quality player like Haythornthwaite but knows it is an incredible opportunity for her and one that she has to take. “Of course we are disappointed that Natalie won’t be in black-and-gold again this season but it’s a choice we fully support her in,” she said. “We have been in constant dialogue with Natalie since we won the Vitality Netball Superleague Grand Final in July. “Everyone knew she would go out to Australia and impress, but we still held an offer open for her until we knew for certain that NSW Swifts would look to sign her. Natalie Haythornthwaite was the standout player of the Vitality Netball Superleague last year, and was voted the 2015 Player of The Season. The 23-year-old from Burnley, who plays Goal Attack, Wing Attack and Goal Shooter was integral in Yorkshire Jets’ season, leading by example as vice-captain and helping them to the play-offs for the first time in their history. After six years with Jets, Haythornthwaite naturally caught the eye of other Superleague franchises and for the 2016 season, made the switch across the Pennines to Manchester Thunder. Haythornthwaite was former ANZ coach Dan Ryan’s first signing, with his experience in the antipodean league being the main factor tempting her to move. She’s a player with huge ambition and the perfect replacement for Australian Chelsea Pitman who left Thunder in the off-season to make a return to the ANZ to play for New Zealand side Mojo Pulse. Last season was pivotal for her as she came into her own in the Superleague and turned heads for international selection. She was selected by England to join the World Cup warm-up series against Trinidad and Tobago where she gained invaluable experience on the international stage playing alongside experienced England players. This international nod, combined with her consistent Superleague form, translated into being selected for the Australian Diamonds three-Test Series against the Roses in January. For a dedicated full-time student, studying Speech and Language Therapy at Leeds Beckett University, Haythornthwaite is balancing two very hectic schedules, but it’s definitely doing her no harm on the netball court!